Groupon is a service that can save you money through the use of virtual coupons. Much like a physical coupon book, you can use Groupon to get deals of up to 70 percent off of all sorts of things, from food and retail products to travel and services. When you use Groupon, you can see local deals as well as deals from any location you search for. You can use Groupon on a computer and from a phone or tablet. You can sign up for Groupon through their website at Groupon.com. Groupon is also available on mobile devices; you can get Groupon for iOS or grab the Groupon Android app. Use your email address to sign up for Groupon or log in with your Facebook or Google account to speed up the sign-up process. If you plan to use Groupon on your phone and computer, be sure to log in to both with the same account (i.e., if you log in to Groupon with Facebook on your phone, do the same on your computer to access the same account). Many types of coupons are available with Groupon, and they're really easy to find on both the website and the app. Coupons are separated into categories like electronics, toys, entertainment, fashion, pet supplies, and more, as well as by companies like Amazon, Hotels.com, Target, Vistaprint, Nike, American Eagle, Walmart, and Shutterfly. Go into any category to see which coupons are available for that specific category type or from that particular company. If you're near a store where Groupon can help you save money, the app can notify you about the deal so that you can get a virtual voucher before you make the purchase. If you're on a computer, Groupon might direct you to the company's coupon page where you can print coupons to take in the store with you. Another way to find local deals from your phone is to browse the Groupon app from the local section so that the only coupons you see are for deals near you. You can filter the results by distance from where you are right now and price. Groupon also has a Deals of the Day page that updates every 24 hours with fresh, limited-time deals. In addition to daily deals are getaway deals where you can save on travel expenses by booking through Groupon. You can buy these deals directly from Groupon from your phone or computer. Email alerts to get notified about new coupons from your favorite stores. Groupon Bucks on qualifying purchases to get even more discounts in the future. Things To Do to find events near you that are cheaper with Groupon, and filter the results by category — like nightlife, tickets and events, sports and outdoors, and kids' activities — or by price or location. Groupon deals on an interactive map that shows the deals displayed on your city for an easier-to-see selection. Adding items to your wishlist to decide later whether to purchase them. Promoting your own business on Groupon with Groupon Merchant. Earning cash back at your favorite restaurants with Groupon+. On occasion, there's an "extra 20% off" area of the website where you can find even more discounts, though these deals are usually limited to just a few local deals and are only valid seasonally. Groupon Gift Shop, an easy way to find specifically priced gifts for men, women, kids, and babies. Gift cards for use at Groupon. Becoming a Groupon affiliate partner to earn money promoting deals. 30-day money-back guarantee for goods purchased through Groupon. Students get 25 percent off local deals for six months, and then 15 percent discounts for as long as they're students. When you use a coupon code at Groupon, there, of course, isn't a purchase you have to make through the Groupon website because all you have to do is copy the coupon code and use it on the website in question. However, if you're buying something directly through Groupon, there are multiple ways to pay. Android users can pay with PayPal or a card, too. How Does Groupon Benefit From Deals? Since Groupon is a middleman service that promotes restaurants and stores, in return from the company they're promoting, they earn a commission each time they successfully refer a customer. Why Is Groupon So Popular? Groupon is very popular for two reasons. First, Groupon users are modern consumers who love to spend money. They especially love to buy when they get a discount or a perceived bargain. Groupon works because it provides tempting choices for its motivated group of consumers. Second, Groupon can easily become viral, and its daily discounts spread quickly through email. Groupon subscribers like to forward daily deals to their friends, and in a world of social media and online personal suggestions, an email suggestion carries a lot of influence. 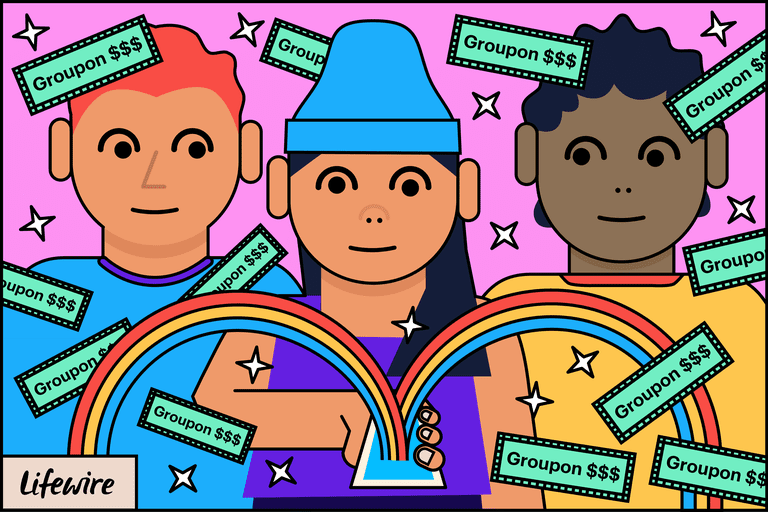 Groupon subscribers are even given a $10 incentive to refer friends, so it makes sense for users to be even more motivated to spread the word about Groupon and encourage people to take advantage of the deals. Is There a Catch With Groupon? The only catch is the time-limited nature of the Groupon discounts. With some deals, once they're announced and posted on the site, they're relevant for only 24 to 72 hours, after which the discount is no longer available. Coupons, on the other hand, are commonly valid for six to 12 months after you purchase them, so there's no rush to redeem the coupon the same day. However, they do usually expire at some point, so even the coupons you see on Groupon are not going to be there forever. Like any form of sales, the provider wants to make it urgent for the customer to purchase, so when you see a Groupon deal that interests you, definitely jump on it within the next couple days. See Groupon alternatives for other ways you can save money.